These little baby's are my arch rival, I just can't make a perfect macaroon to save my life. 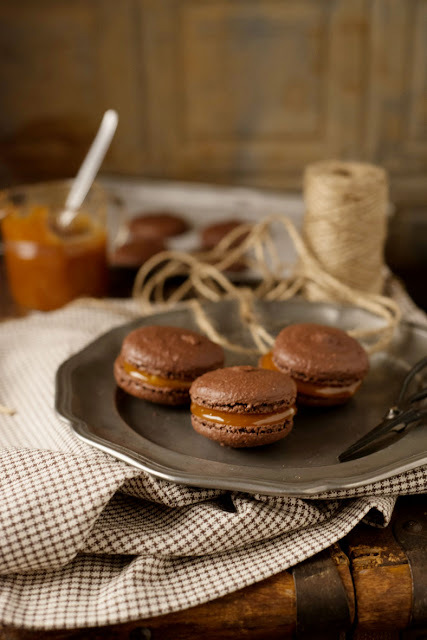 This next recipe is as good as its going to get, they're a little bit bumpy, but these baby's have feet, whoooooohoooooo, finally they have feet, no not the type of feet there going to get up and walk out on me but a little bubble foot like all good macaroons should. Every time I try to make them something goes astray, it probably has something to do with my inability to follow the instructions, after the first three batches you would think I would learn but sadly no. 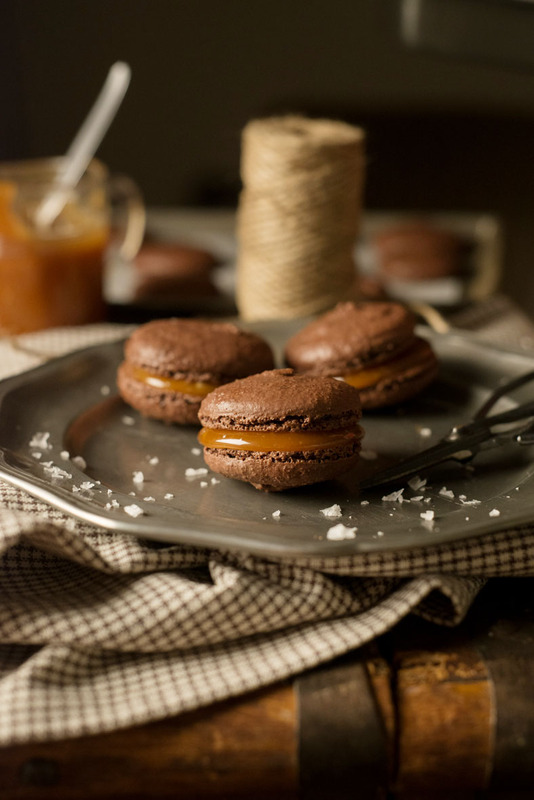 I was telling one of my most loyal readers that I just couldn't make them, and the next thing I know she had bought me a cookbook on Macaroons (Thanks G) So after reading through that I have learn't a few secrets and worked out a recipe that some how miraculously worked. The secret is italian meringue and man oh man do I love the Italians for this one. 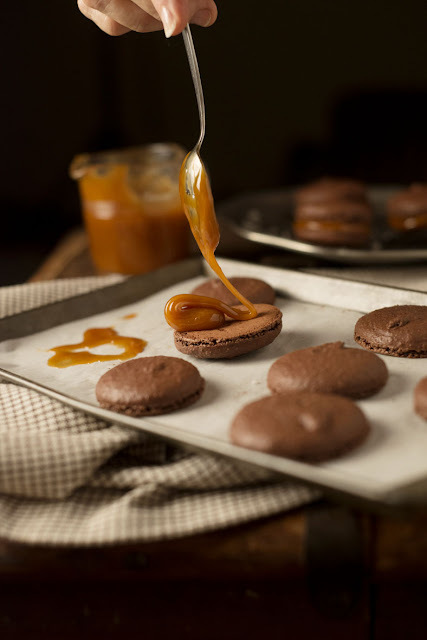 If you make macaroons with an italian meringue, by pouring hot liquid sugar into the egg whites rather that using sugar straight out of the packet, it works. Well it works for me and as the saying goes if it can work for me it can work for you. 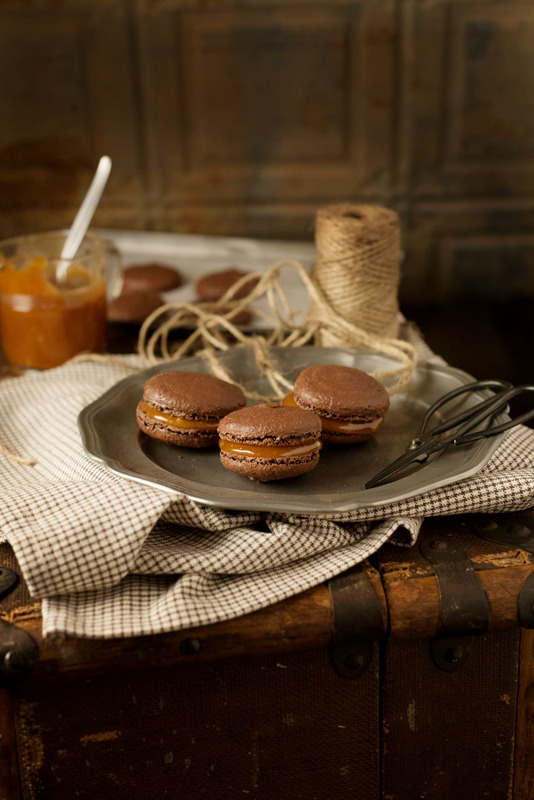 I did read that chocolate macaroons are the hardest and trust me to want chocolate ones, but really who can resist chocolate? Place the sugar and water into a saucepan and heat until the sugar melts and boil for about 4 minutes, brush the sugar down from the sides with a wet brush so the sugar doesn't crystallise. In and electric mixer beat the egg whites until they form peaks, slowly add the hot sugar syrup while constantly whisking. Whisk until the mixture is glossy. Sift the icing sugar, cocoa and almond meal in to a bowl then slowly fold this into the meringue mixture a little at a time. 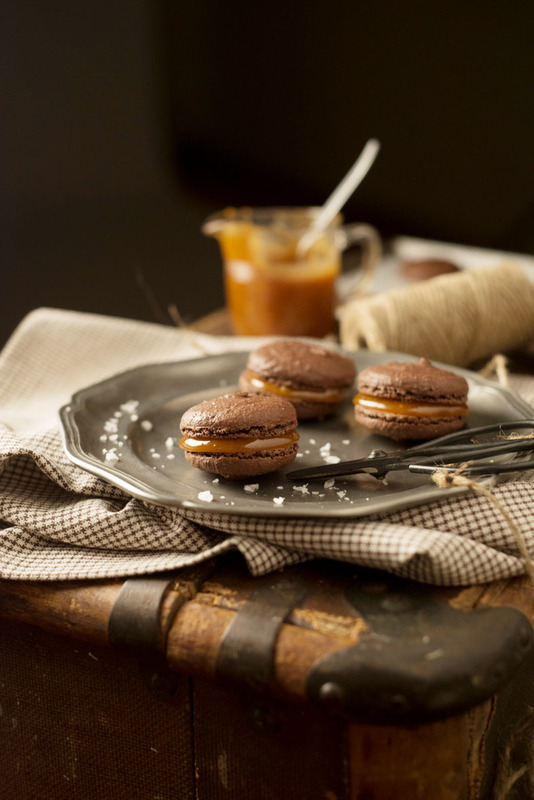 Place into a piping bag with a 1cm nozzle and pipe 2.5cm rounds onto a lined baking tray. Set these aside until the the tops of the macaroons are firm to touch approximately 30mins. 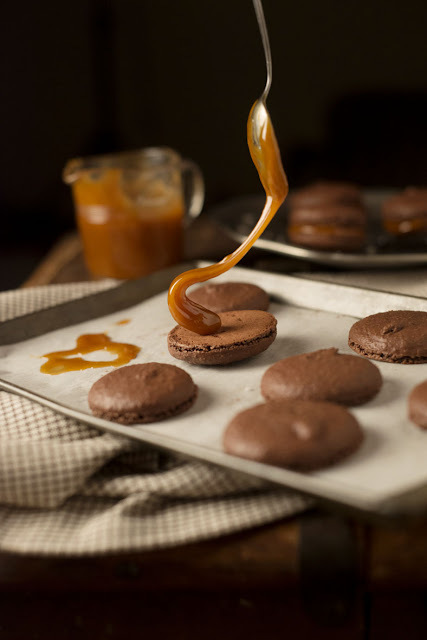 Bake for 15-20 minutes or until the macaroon bases are firm. 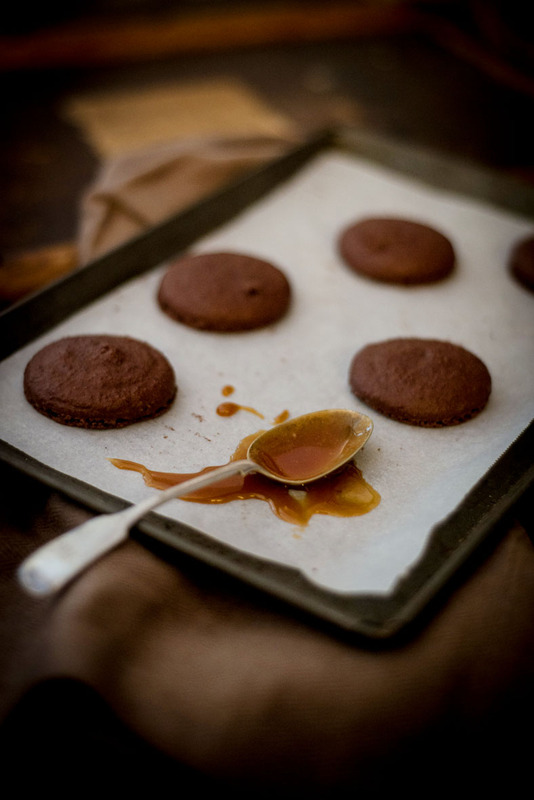 To make the caramel filling, Place the sugar and water into a saucepan on a medium heat, stir until the sugar dissolves and it starts to boil. Let it boil until the syrup turns a golden colour. Then remove from the heat and stir in the cream, golden syrup, butter and salt. Be careful not to burn yourself as the mixture will bubble up and let off steam. 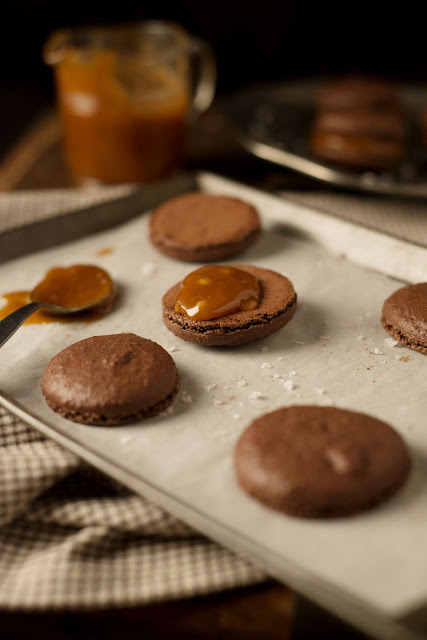 Leave the caramel for 10mins to cool slightly and spoon onto the macaroons.